Posted October 30, 2017 by The Rapid & filed under Places to Go. Cold weather and shorter days are here to stay as we welcome November. Fortunately, there is still so much to do throughout Grand Rapids before winter arrives. Comedy, shopping, museum days and delicious food and drink specials will fill up your calendar this month. 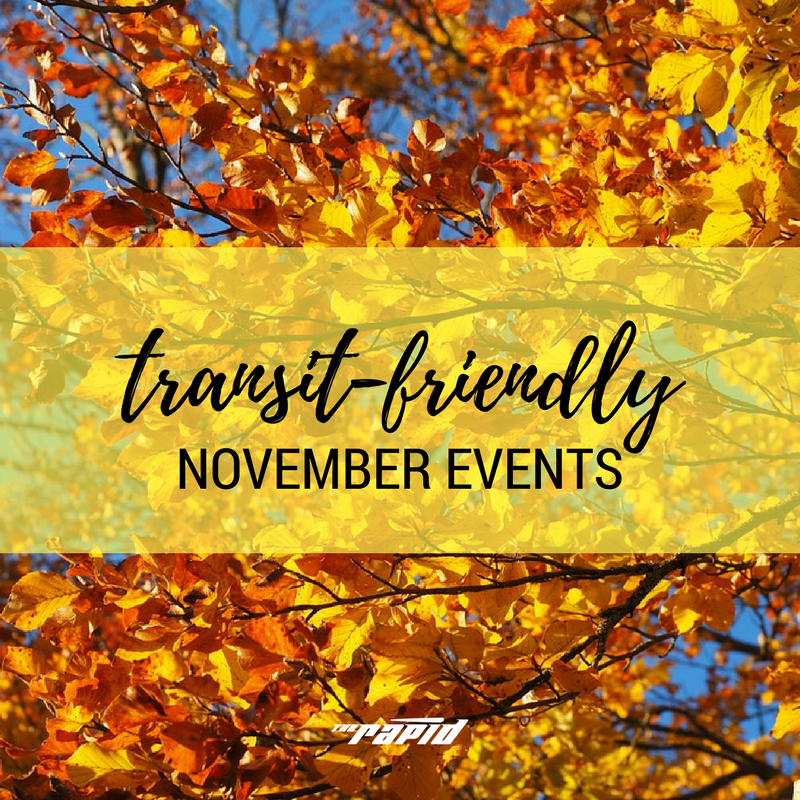 Avoid the hassle of parking and ride with us to make the most out of your event travel this month. From Oct. 30 through Nov. 6, ride with us to hilarious comedy events throughout downtown Grand Rapids. The home base for the Grand Rapids Improv Festival is Dog Story Theater (7 Jefferson Ave), however, there will be loads of performances, workshops, special events and even networking to partake in during this week of improv. Some events include Beyond Hamilton: A Musical Improv Workshop, Leading Ladies, and Improv Hop! View the full lineup here. Locations vary based on the events. Shop for a cause to kick off this holiday season. This event on Nov. 3 and Nov. 4 features the best in stylish women’s clothing and accessories, holiday and home decor, handmade arts and crafts, children’s clothing, and specialty local and gourmet foods. This event takes place at The Cultural Center at St. Nicholas on East Paris. Along with 100 percent of ticket sales, these funds directly support Junior League of Grand Rapids’ projects improving children’s physical health in our community, including Backpack Buddies and Kids in the Kitchen. Routes 5 and 24 can get you there. Enjoy fall at Richmond Park with this free, family-friendly on Nov. 4. There will be outdoor ping-pong, kayaking on Richmond Pond, cider and donuts, snacks, face painting and more! Route 9 can get you there. Do your holiday shopping with 60 artisans who focus on repurposing, upcycling or recycling materials in their work! This holiday market takes place at City High Middle School on Nov. 4. It’s just $2 for admission. Route 11 can get you there. Don’t miss the largest exhibition of lifesize, moving museum-quality dinosaurs in North America! This traveling exhibition is coming to DeVos Place on Nov. 3-5. Bring your kids or favorite little ones to see 80 life-size dinosaurs, dig for fossils, play in mazes and do dino crafts. Tickets range in price from $14 for seniors to $29 for all-inclusive kids VIP tickets. Get yours now. Routes 11, 13 and the SL can get you there. Throughout November, make some time to learn more about the power of the brain at the Grand Rapids Public Museum. This exhibit takes you inside the brain to discover basic inner workings! Routes 7, 9, 12 and 50 can get you there. Sip local from Nov. 8-19 for a celebration of the art of the craft cocktail in Grand Rapids. Participating bars and restaurants will feature specials to get two Michigan cocktails and a shared-plate appetizer for $25 or less. There will also be a full schedule of cocktail events and other special offers here. Routes 1, 2, 3, 4, 5, 6+ can get you there. On Nov. 10, ride The Rapid to the Downtown Market for a day of celebrating the home-cooked, hand-made and heartiest meals! Market merchants will be serving up homestyle favorites like mac and cheese, cheddar beer bread and smoked meatloaf. Yum! Routes 1, 2 and the Silver Line can get you there. Get on board to see this main stage holiday musical at Grand Rapids Civic Theatre! Annie is a musical about an orphan searching for her family in the 1930s. This musical will be on stage from Nov. 17 through Dec. 17. Tickets range in price from $15-$27. For a decade, this festival has been serving up more than 1,800 wines, beers, ciders, and spirits. Whether you’re a beverage connoisseur or just a novice, there’s something to please everyone’s palette at this event. This festival takes place from Nov. 16-18 at DeVos Place with single-day admission for $15 or a 3-day pass for $40. Get your tickets here.